In politics, it is usual to allow bygones be bygones after election day has come and gone. 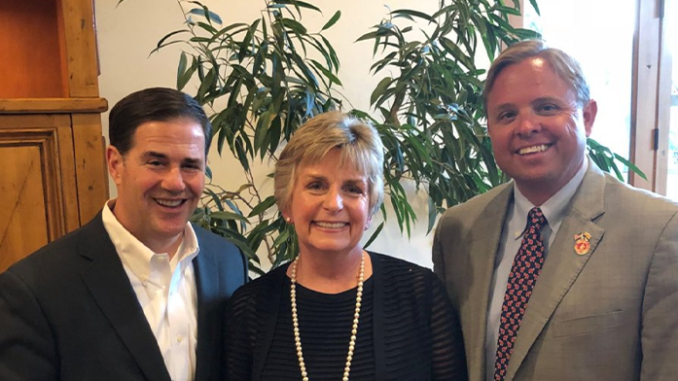 Jonathan Lines may have gotten himself and the AZGOP into some serious hot water by continuing a long-running fued with former State Representative Maria Syms and her husband Mark. Of course the courts have never determined any such thing, Lines has to know that there is no fraud that can possibly committed by someone changing their voter registration in order to run in a general election, Syms was never convicted of anything, nor was she ordered to pay restitution to Brophy McGee. Brophy McGee was awarded legal costs so it may be that Mark Syms might end up on the hook for the $70,000 that Brophy McGee claims to have spent on the various legal fights, but even if you set that aside as possible confusion, Lines’ other claims seem defamatory, deliberate, and dumb. If the courts agree, Lines and the AZGOP may be on the hook for a substantial amount. Let it go Chairman Lines. That fight is over and while you may think you won because Syms lost her seat, the fact is that the Democrats won because they’re the ones who picked it up, along with three other State House seats on your watch. So maybe spending more time fighting Republicans in District 28 isn’t such a great idea? How about negotiating an apology and clear retraction and see if the Syms will let you and the party off the hook in return? Looks like McCain still has the reign in the Republican Party. He single-handedly ruined the GOP in AZ. The McCain machine needs to be crushed. Let’s hope the AZGOP can clean up its act Saturday and elect someone who will drain the swamp. The 28 JAN meeting “UPSET” because of a roll call vote……..
We will see. Will Kelly get lynched like one of our elected people last year, unable to do anything? CHANGE the PROXY rules (as above) and I will take MY GOP (AZ & MARICOPA) Seriously! I like the roll call vote and hope Kelli continues with it. It you can’t show wup to a meeting 1 time a year don’t become a PC. Simple.